Goodness y'all, it feels likes forever since I've talked to y'all. Well, really it's only been two days if you don't count the weekends since I hardly post then. 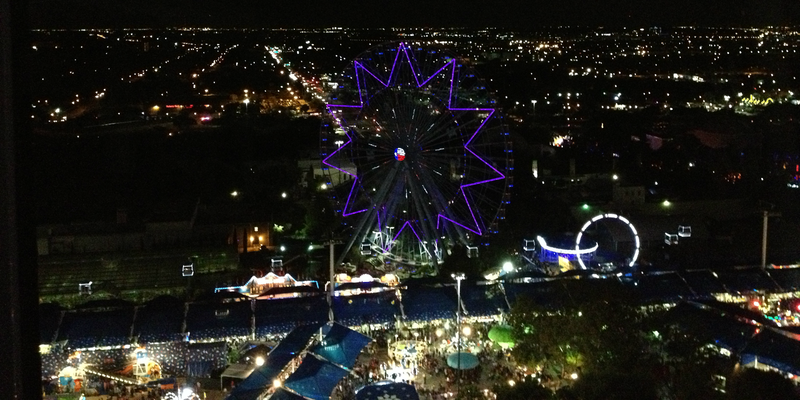 Are you as excited as me that this is the last of the State Fair of Texas post for a good year or so? I am also happy to report that I accomplished everything on my fair list. The last two items I had: See Kacey Musgraves and enjoy my yearly ferris wheel ride are checked off the list. Heck, they best be checked off cause the fair is ova. I went to the fair on Friday and was super excited, y'all. I decided to forgo the ferris wheel and ride another ride. As much as I love that thang it hasn't changed in all the years I've seen it at the fair. This year I decided to ride a new ride. You see last year the fair opened this ridiculous swing. That thing was huge and scary. I was at the fair last year when the dern thing got stuck and they had to close out sections of the fair. We almost got trapped at Midway because of that nonsense. Did I mention Midway is where all the games and rides are? Well, this year they got rid of the swing and replaced it with an observation tower. You are enclosed on this big circle that takes you up and then does a slow 360. You could see all of Dallas Fort Worth. Well worth the seven dollars. I was also able to see all of the fair and got some great video for the youtube video I plan on making. Did I mention that I used to be a Youtuber in my former life. Keep checking back this week and I'll eventually post link to all that mess. 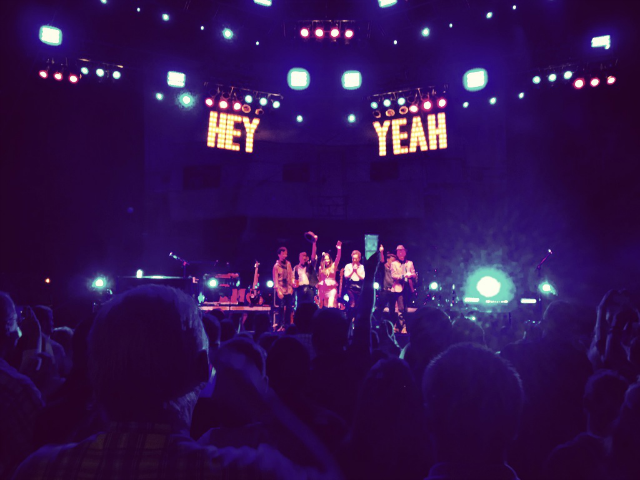 After I rode the new observation thang I stopped for food and then headed over to see my girl Kacey Musgraves. Can I just say that homegirl put on a great show? Wait, do people still say homegirl? Well, I sure as Jesus do. I also just really love Kacey Musgraves and saying just and really in sentences. While all of this is great I just have to tell a quick story before I leave y'all. So I was supposed to go to the fair with Bestfran Numero Due. Last minute her and boyfran couldn't go cause he got the flu. I decided to go anyway. Well, more like I was already headed down when she texted me apologizing cause she meant to text me that morning. The fair is located in Fair Park which happens to be one of the worst areas in Dallas. It's just not a safe area no matter how you slice it or how many more attractions/museums the city of Dallas tries to add. After the concert I waited around for a few minutes to see if I could see where Kacey Musgraves was coming out. I figured it was getting late and I should head to the entrance where the trains are so I could catch one before they got to crowded. Y'all as I was leaving I had to pee so bad and thought I was gonna pee on myself but I kept walking. There was police everywhere and they were trying to usher people out the fair quickly. I didn't know what was going on but I followed the herd of people. So many things were blocked off and the police were just trying to get people on any train. I was so confused till I hear this older gentleman yelling there was a stabbing and they just shutdown the fair. Y'all I jumped on the first train that came my way all the while almost about to pee on myself. The train was so packed but we didn't even care. But I don't know because I never saw anything on the news etc. I texted James and he turned on his police scanner and goes, "We turned on the police scanner. Apparently there is one dead and multiple injuries. They've been waiting on CSI for an hour." And my response was, " OMG good to know. It was high school night. Police where everywhere and tons of ratchet teens. Glad I was with the white people listening to country music." Whelp, needless to say it was a crazy night and I ain't very politically correct in real life. To be fair ratchet knows no skin color and there wasn't just "white" people on that side of the fair enjoying the concert. Until tomorrow y'all. And I hope y'all had fun living through me. Oh my gosh! We were at Fair Park Sunday and new nothing about this! Yikes! Glad you stayed safe. I LOVE wave swings and just googled what you mentioned. That's just lovely.